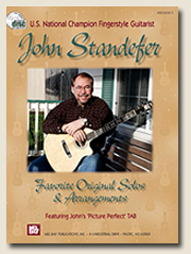 This book contains eight great fingerstyle guitar solos from John’s ‘Guitar Stories’ CD, which is a collection of his best original compositions and arrangements. Written in John’s exclusive ‘Picture-Perfect’ TAB, this book is extremely complete and easy to read. Companion CD tracks included as mp3 files.